Oberon [OH buh ron] is the outermost of Uranus' moons and is the second largest. It was named after the King of the Fairies and husband of Titania in Shakespeare's Midsummer-Night's Dream. 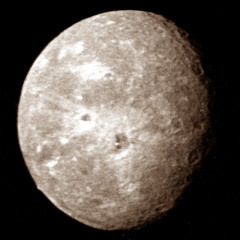 Oberon was discovered in 1787 by the British astronomer, Sir William Herschel, who also discovered Uranus. Most of what we now know about this moon was discovered by Voyager 2 in 1986. Oberon is very similar to Umbriel in composition, although Oberon is about 35% larger. As with all of Uranus' moons, it is believed to be composed of about half water ice and half rocky material. 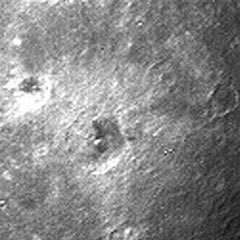 The surface of Oberon is heavily cratered. 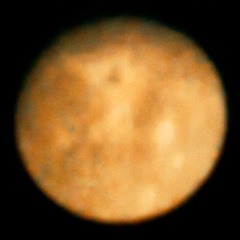 The lack of other surface features indicates that it has probably been stable since its formation. An unidentified substance covers the floors of many of Oberon's craters. Astronomers are not yet sure where this substance originates. One theory suggests that it could be "dirty water" that upwelled into the crater after impact. The most notable features of Oberon are its craters. These craters are more numerous and much larger than those on Ariel and Titania. Some of these craters exhibit bright rays of ejecta material similar to those on Jupiter's moon, Callisto. Several images of Oberon show a lone mountain peak rising 4 miles (6 km) above the surface. In the southern hemisphere, large faults can be seen crossing the surface. This may be evidence of some type of geologic activity early in the moon's history. Oberon has no detectable atmosphere and no magnetic field.